Before entering Thai temple, you should take off their shoes. 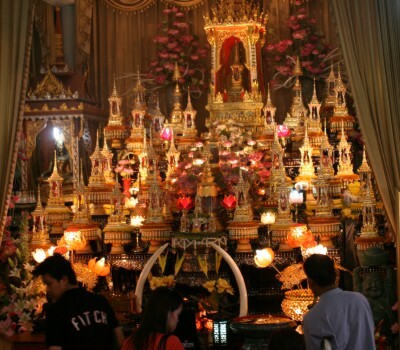 Also proper behavior and fees is Clothing essential for a temple visit to Thailand. Thus, flip-flops, shorts and sleeveless are Shirts indisposed! 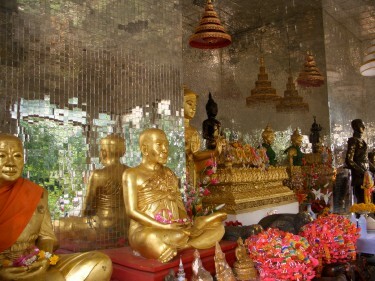 When sitting in Thai temples, the legs are never stretched out, it is best to sit on his knees. Thai monks are usually very open and secular, for example, it is not uncommon to see smoke in public. Also it can easily happen that men will be raised by monks. Women should not touch monks or their robes (which also has validity outside the Thai Temple)! Otherwise, the monks must undergo an elaborate cleaning rituals. Women want to give something to a monk, it must place it either on the ground or else it before a man to give it then handed over to the monk.